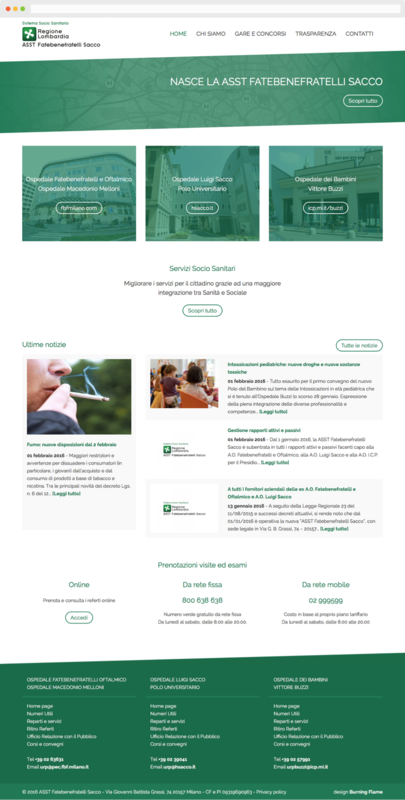 The ASST Fatebenefratelli Sacco is the health service of the Lombardy Region, which includes the four hospitals Luigi Sacco, Fatebenefratelli, Macedonio Melloni and Vittore Buzzi. The web portal was created with the aim to serve as a hub to the four hospitals websites as well as collecting common information and news. The website, designed with particular attention to the mobile user experience, features a responsive frontend, optimized for viewing via smartphones, tablets and desktop computers. Content management is entrusted to the Open Source WordPress engine, customized according to specific needs.